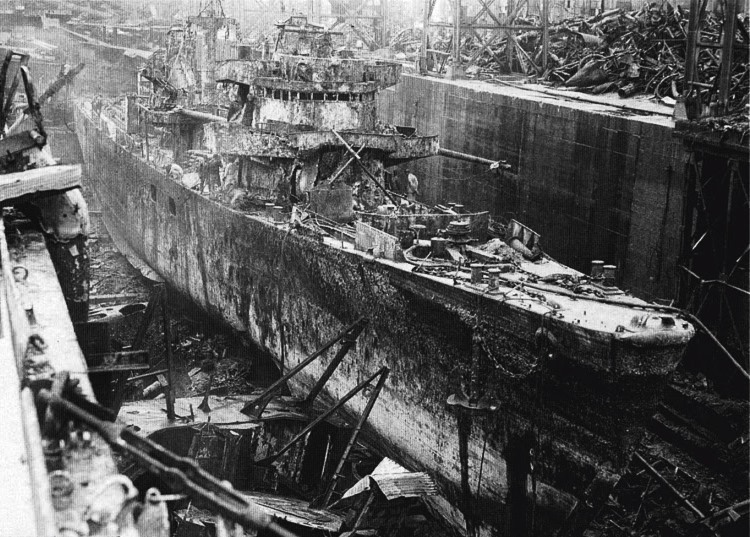 Kure Naval Arsenal Laid down as Ship No. 2921, a 1,500-ton No. 1 class landing ship. LtCdr Shinohara Zensuke is appointed Chief Equipping Officer (CEO). Completed. Attached to Kure Naval District. Assigned to the 31st Naval Transportation Unit, Combined Fleet. LtCdr Shinohara is the Commanding Officer. At 0815, Colonel (later Brig Gen) Paul W. Tibbetts’ B-29 "Superfortress", nicknamed "ENOLA GAY", of the 509th Composite Group, drops the 15-kiloton yield "Little Boy" uranium atomic bomb on Hiroshima, thus opening the nuclear age of warfare. That same day, four kaiten human torpedoes are deployed from Otsujima Training Center (secret base "P") to be attached to Rear Admiral Yokoi Tadao's (43)(former CO of CHIYODA) Sixth Special Attack (Tokko) Unit’s base at Tanabe harbor, Wakayama Prefecture. Moscow declares that from 9 August 1945, the Soviet Government will consider itself to be at war with Japan. Despite both cataclysmic events, Japan's militaristic elite still will not yield to the Allies. At 0800, T.21 departs Kure for Tanabe to load the kaiten. 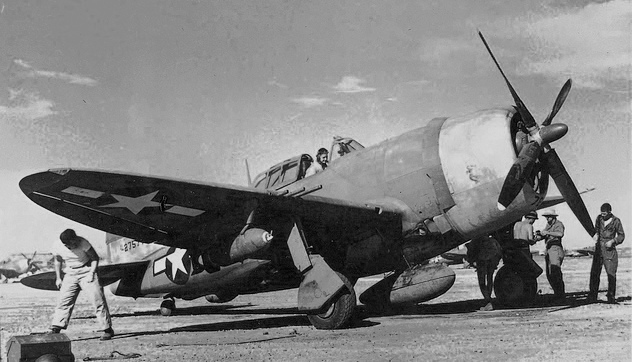 Left: P-47N “Thunderbolt” of the 318th Fighter Group armed with eight .50 cal. machine guns. They could carry 10 rockets and up to three 500-lb. bombs. The P-47Ns flew 1,680 miles (of their 2,000 miles max.range) roundtrip from Ie Shima, Okinawa to Tanabe harbor, Japan and back. 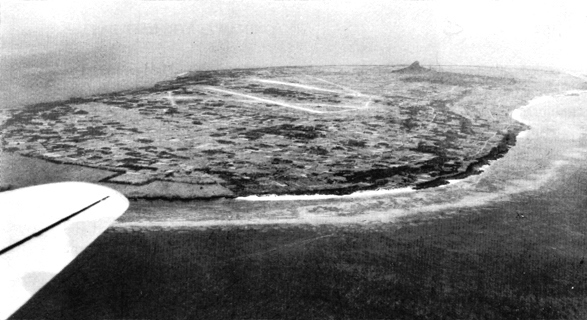 Right: Ie Shima and its airfield and "Pinnacle" strongpoint at Iegusugu. At 1101, that same day, Major (later Brig Gen, ANG) Charles W. Sweeney's B-29 "BOCKSCAR", of the 509th Composite Group's 393rd Bomb Squadron, drops the 21-kiloton yield "Fat Man" plutonium atomic bomb, on Nagasaki. Also that day, Marshal Aleksandr Vasilevsky, CINC, Soviet Far East Forces, carrying out Stalin's pledge at Yalta, launches Operation "August Storm", the invasion of Japanese-held Manchuria (Manchukuo). The attack is made by three Soviet army groups ("fronts") comprising 80 divisions of 1.5 million men. In less than two weeks, the Soviets defeat General Yamada Otsuzo's depleted and ill-equipped Kwantung Army of over 600,000 men. That same day, Japan offers to surrender to the Allies, if Emperor Hirohito (Showa) is allowed to remain the nominal head of state. The offer, if accepted, will save millions of lives, both Allied and Japanese. The United States announces it will accept the Japanese surrender and that the emperor can remain in a ceremonial capacity. The former T.21 is raised and scrapped. The author’s father was among the men of MajGen (later General) Andrew D. Bruce's 77th Infantry "Statue of Liberty" Division's 305th Regimental Combat Team (RCT) who, at 0758 on 16 April 1945, landed on Ie Shima’s Red Beach on the southern coast of Ie, directly south of the airfield. Eight hundred yards inland from Red Beach 2 were fortified cave positions manned by Japanese mortar and machine-gun crews which the 305th RCT engaged in an infantry-demolition fight until nightfall. The airfield fell that first day, but the island was not secured until 1730 on 21 April 1945 at a cost of 172 Americans KIA, 902 WIA, and 46 MIA and 4,706 Japanese KIA (many of whom were conscrpted civilians) and 149 prisoners-of-war (POWs). Some sources incorrectly attribute T.21's sinking to 5th AF B-25 medium bombers. Photo credit goes to the U.S. Army and Navy.